The rainy day that took over the grey historic center of Porto, in the other side of the window, set the perfect stage for a cozy afternoon of Commonspoly at Rosa Imunda. 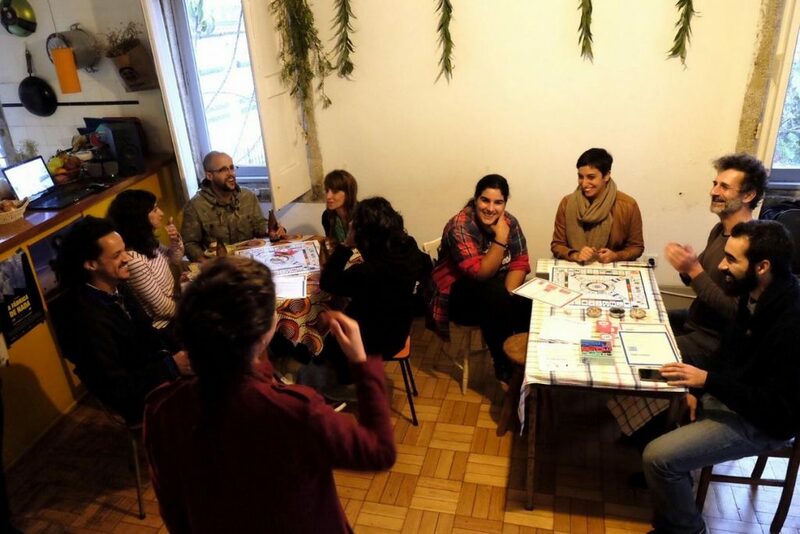 Eleven people showed up to learn-by-playing this board game where no one wins or loses individually – the main goal is to cooperate and “save the commons” by avoiding the privatization of goods and services. The session started with a brief introduction about Commonspoly, how and when it was created, and why it was proposed as a citizen lab in the scope of futureplaces. The choice of the venue was not a coincidence: Rosa Imunda is an autonomous community space and cultural association located at the heart of the city, which is literally surrounded by the pressure of dispossession by economic interests – a contemporary phenomenon that can be compared to the widespread “enclosure of the commons” that took place in England centuries ago, when lands of communal use became property of only a few. Before starting, all players were warned: this game is a work-in-progress and the rules are sometimes ill-defined – part of the challenge is precisely to find ways to surmount the deadlock situations, and to contribute to the improvement of its playability, in collective. As the level of complexity of the game with all its features is not compatible with a two-hour session for beginners, we played a simplified version, without police. 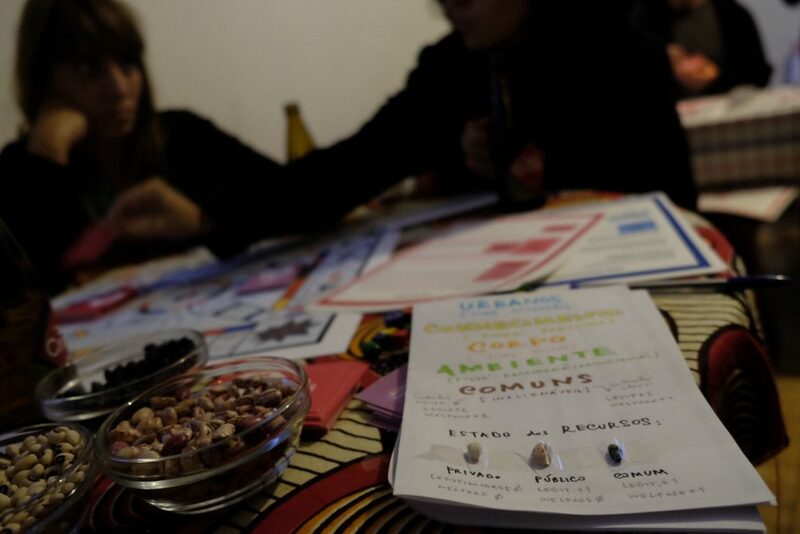 Each table had a “copianço” with a summary of the main variables of Commonspoly: types of resources (urban/rural, environmental, knowledge or body related), their status (private, public or commons), and the “currency” of the game (welfare and legitimacy). And so the game began, with two teams defining each their profiles and strategies to “commonize” as many resources they could in the short time they had, while exercising collective decision-making and practicing cooperation instead of competition. It is about more than simply playing the dice. Commonspoly serves as a device to introduce the commons theories into groups in a pedagogical and ludic way. One of the worst game boxes one can fall on, for instance, is “The Tragedy of the Commons”, named after the influential essay of Garrett Hardin (1968) that dismissed the commons as a failed system of governance and resource management, and which was later rebutted by Elinor Ostrom, the first woman awarded with the Nobel Prize in Economic Sciences. Throughout the game, players are confronted with some of the pains of our current socio-political system – such as privileges of class, gender, citizenship, the impacts of climate change and financial crises, the oligarchy of intellectual property, OGMs and agro-industry – but also with “some powerful community-based tools to struggle against the apocalypse”, as the website of the game puts it to introduce the constructive solutions proposed by the commons, such as co-ops, hacklabs, urban gardens, etc. Being a free licensed board game whose “philosophy is part of the free/open culture movement”, it was also our role as players to contribute to the improvement of the game itself. So, in the end of the session – after taking over the Agora with an uprising collective action to turn all resources into commons! 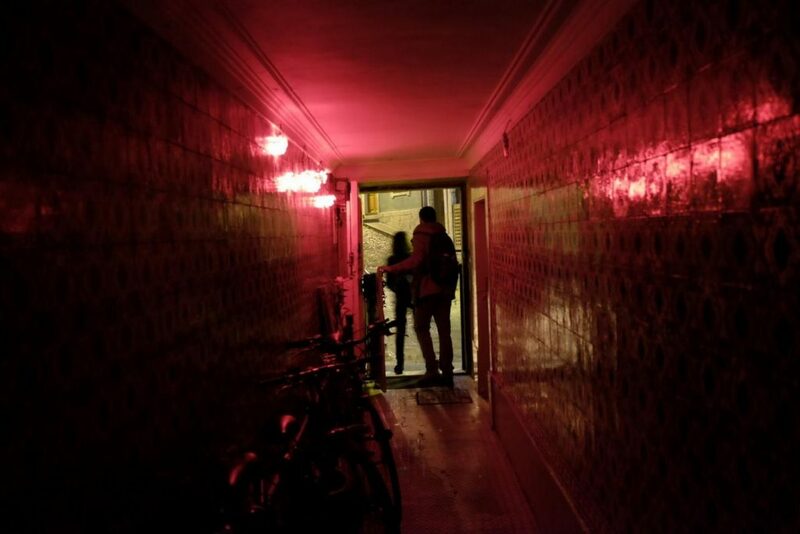 – we did a final round of comments and impressions about our short experience with Commonspoly. 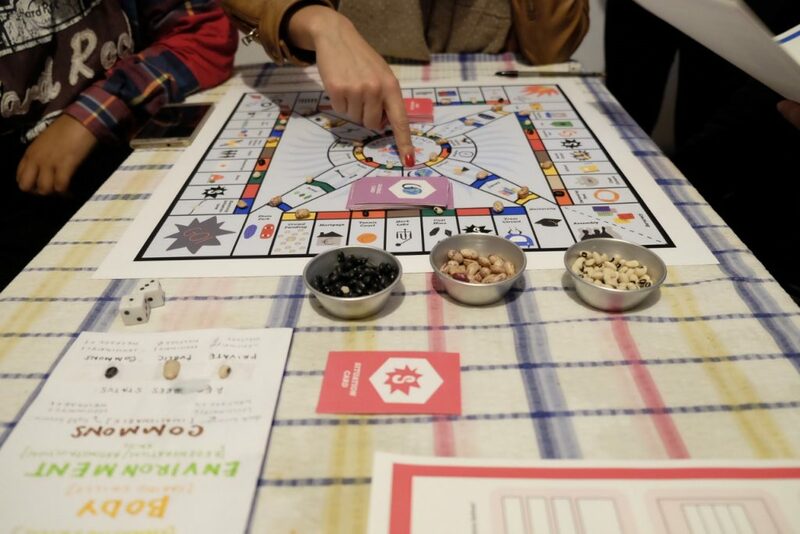 Some of the feedback that was later shared with the open source community, concerns unclear rules, ecological optimization of the materials, and small changes in the graphic design that could make the board game more intuitive. Conteúdo anteriorAnterior Mais pimento, menos cimento!